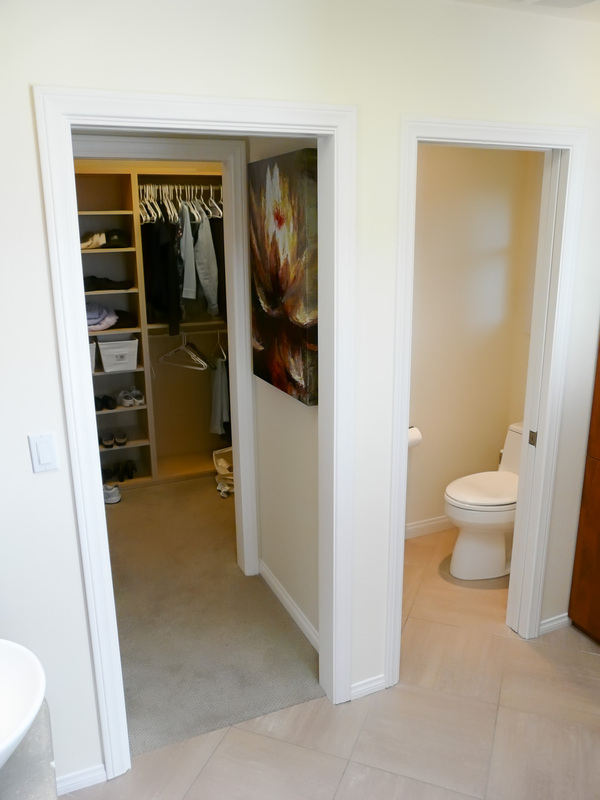 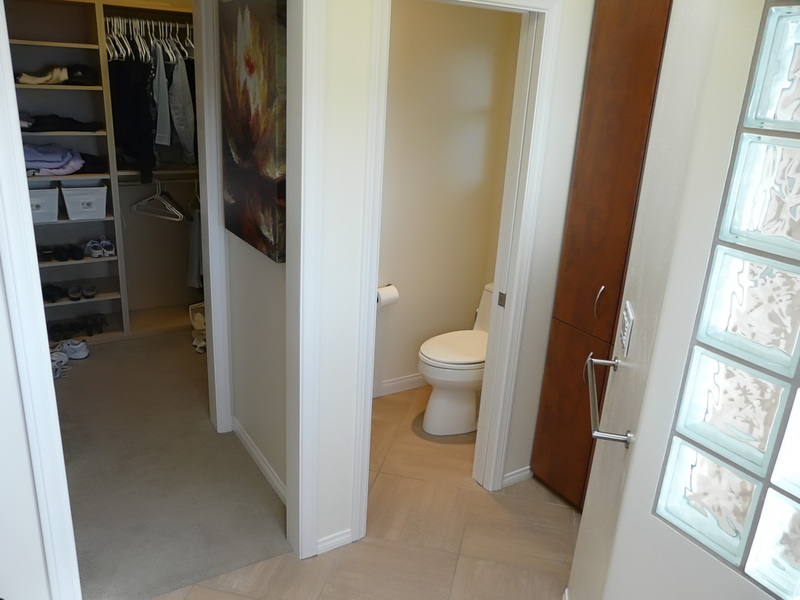 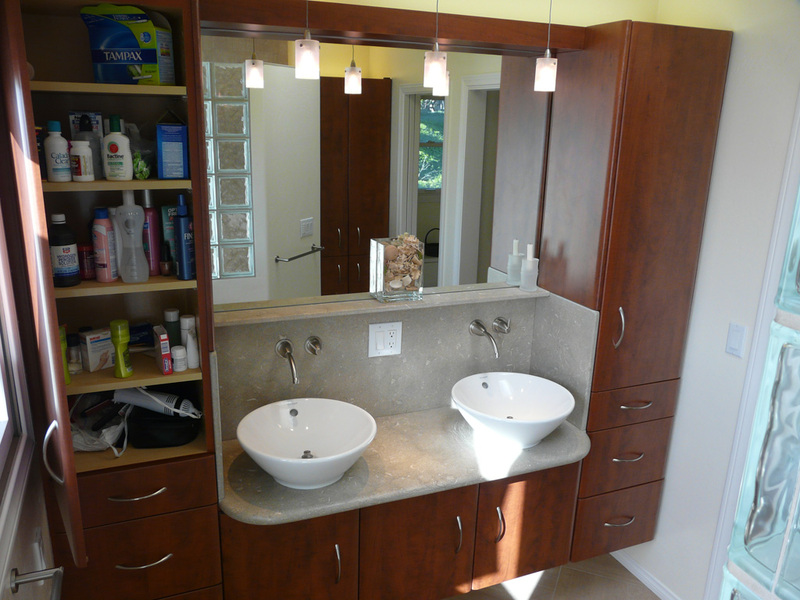 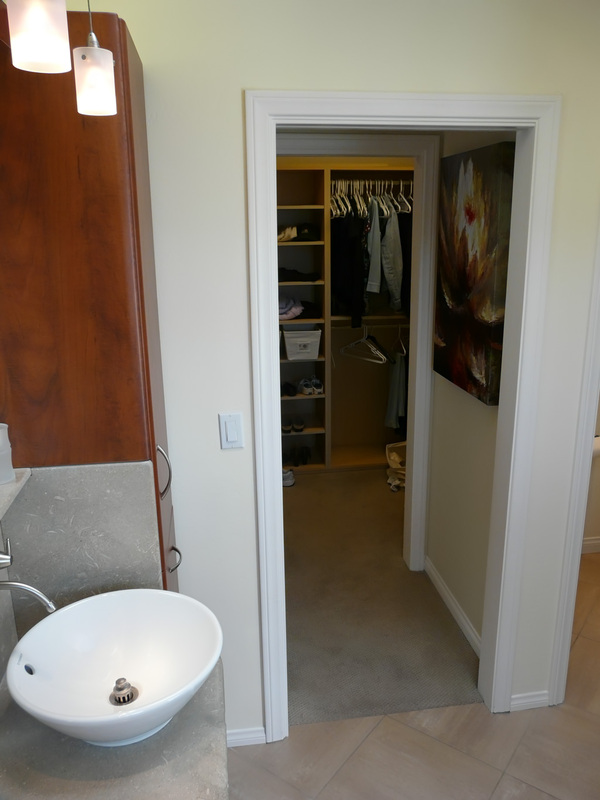 This young couple’s first project when they moved into this home was to redo the master bath and closet. 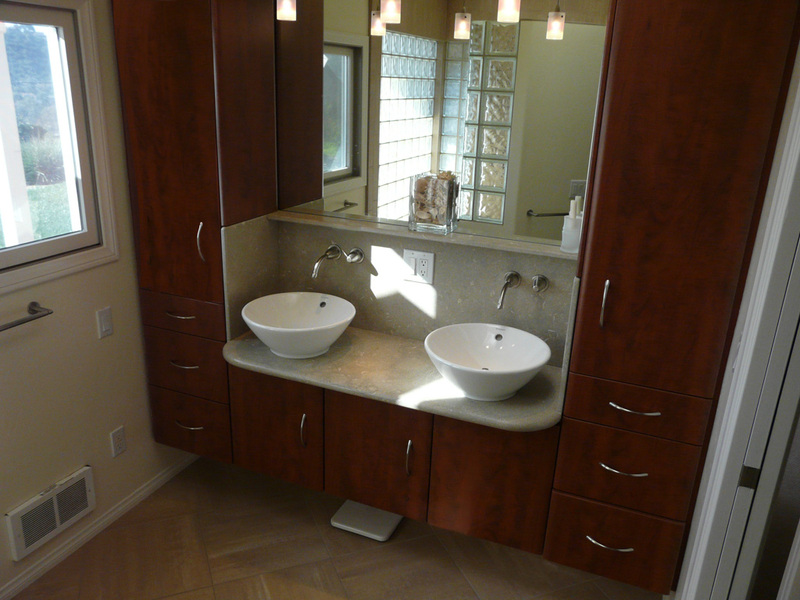 They really valued my suggestions regarding creating a functional bath. 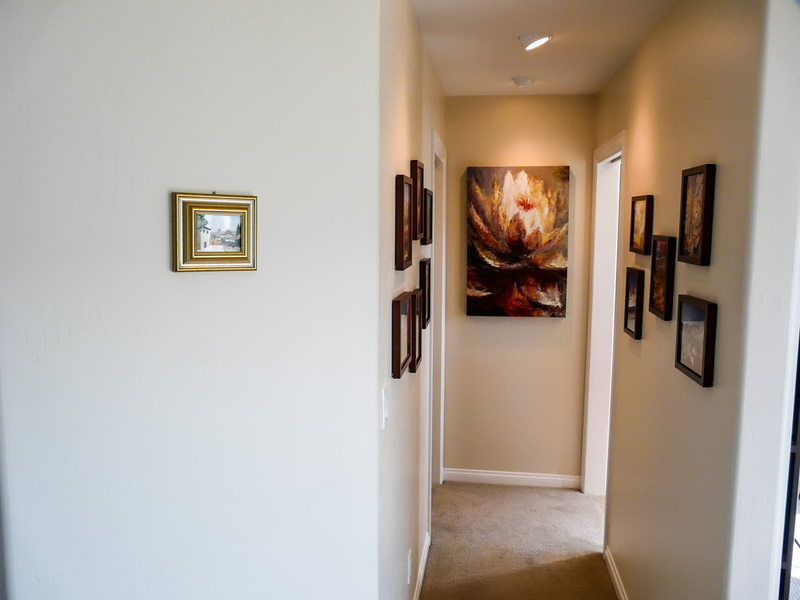 We incorporated all my basic components while helping them create a space uniquely tailored to their own sense of style and design. 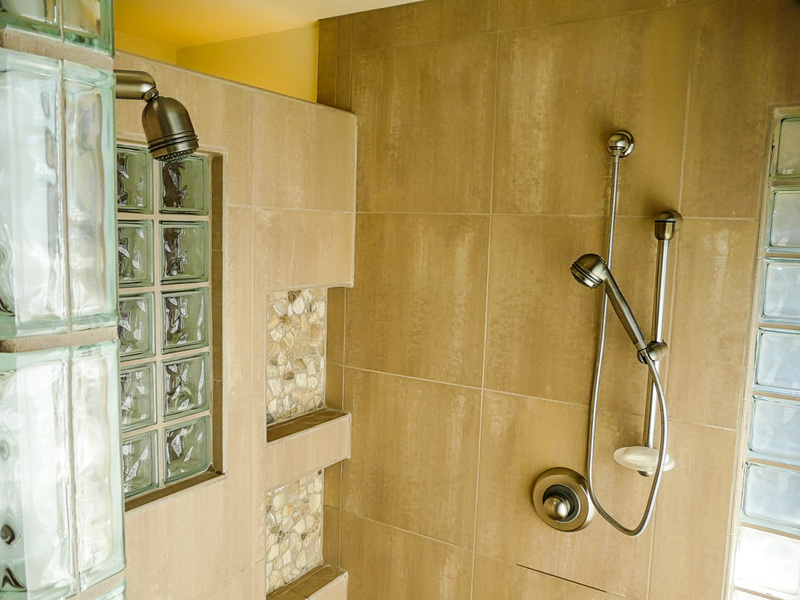 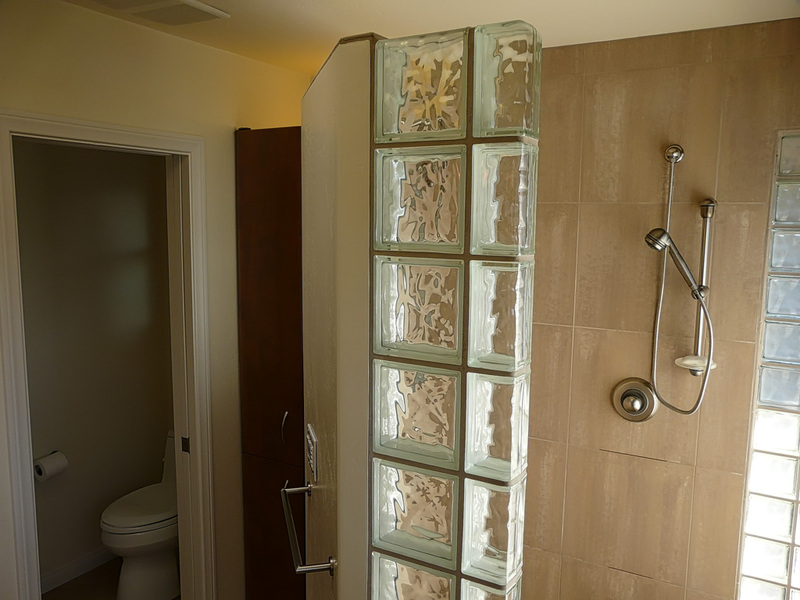 This project was a fun one, particularly the task of creating the walk-in shower for two, Which we accomplished by installing two independent shower systems, one fixed showerhead on one side of the shower and the other an adjustable hand held on the opposite side of the shower. 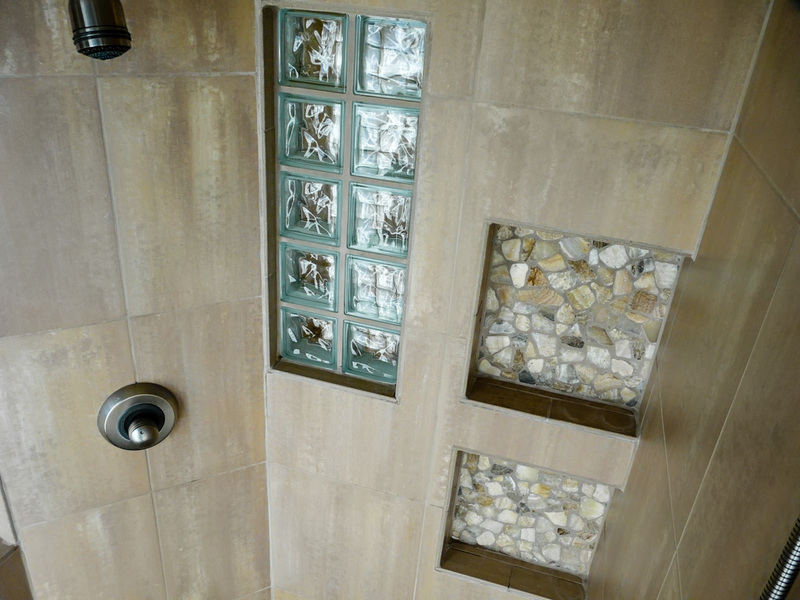 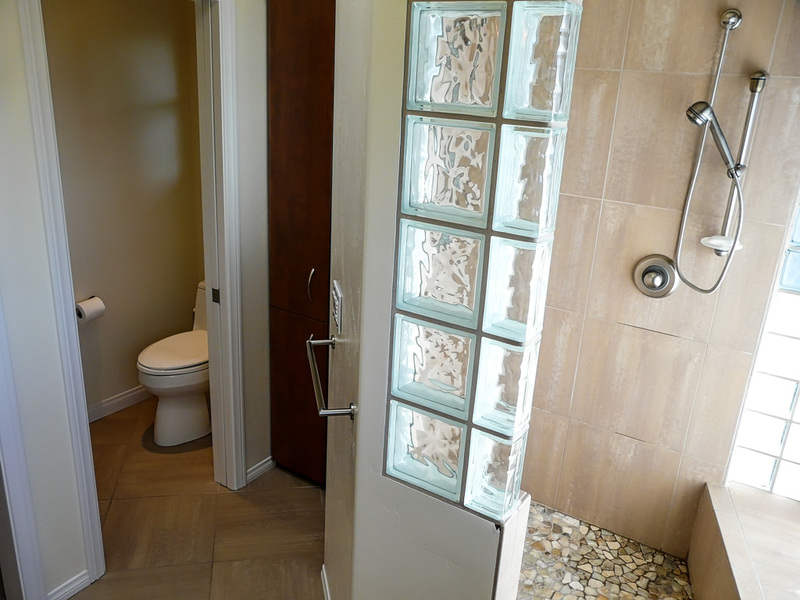 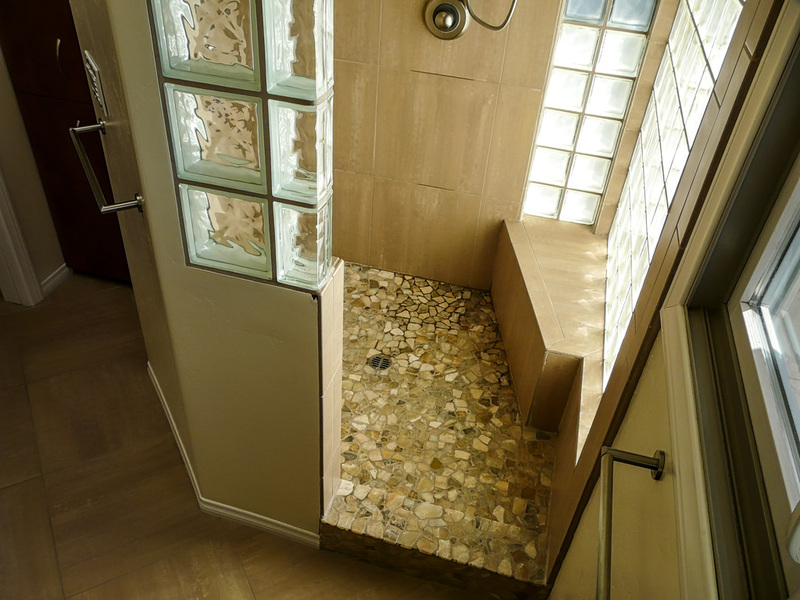 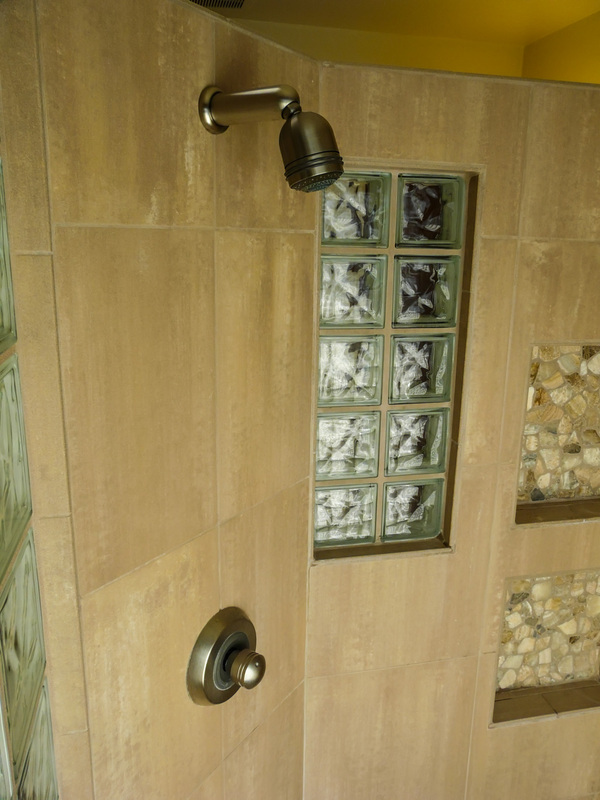 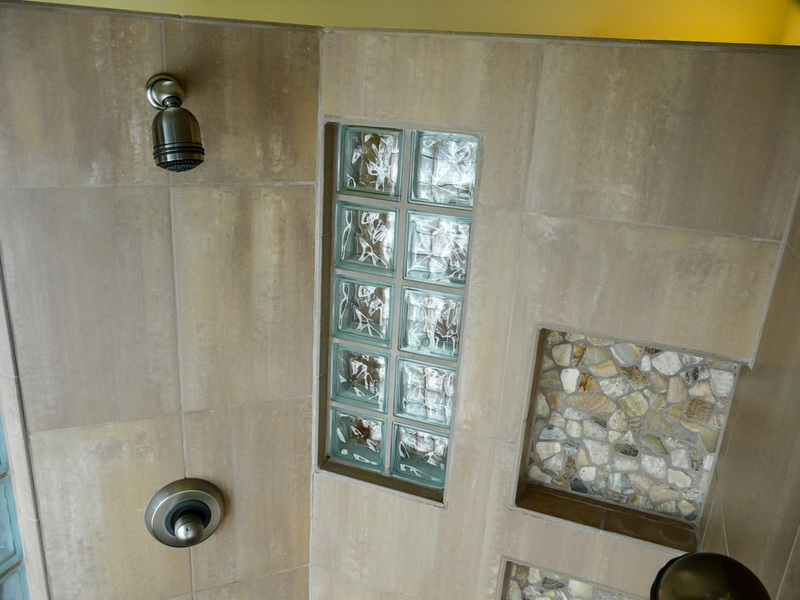 Glass block was used in the exterior walls adjoining the shower to allow more natural light during the day, and exterior lights were added with a switch in the bathroom to allow light to come in through those same glass blocks at night if the client chose to. 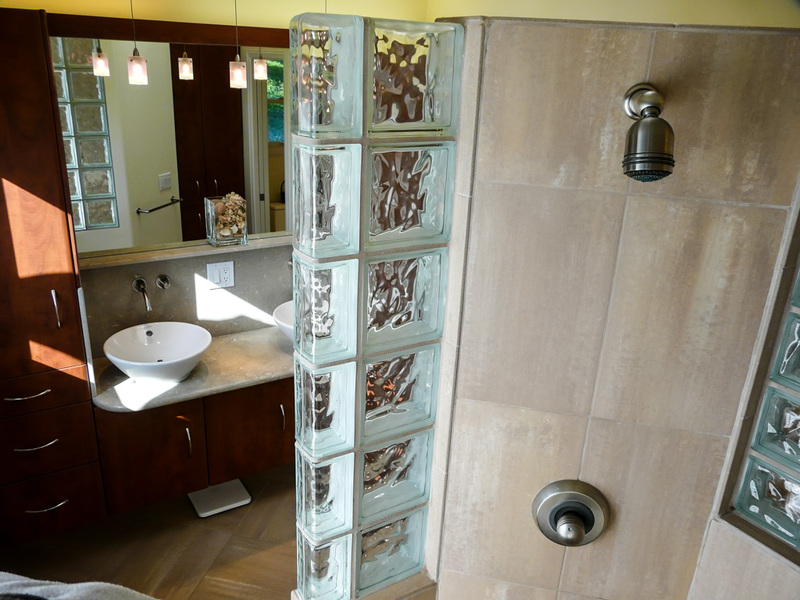 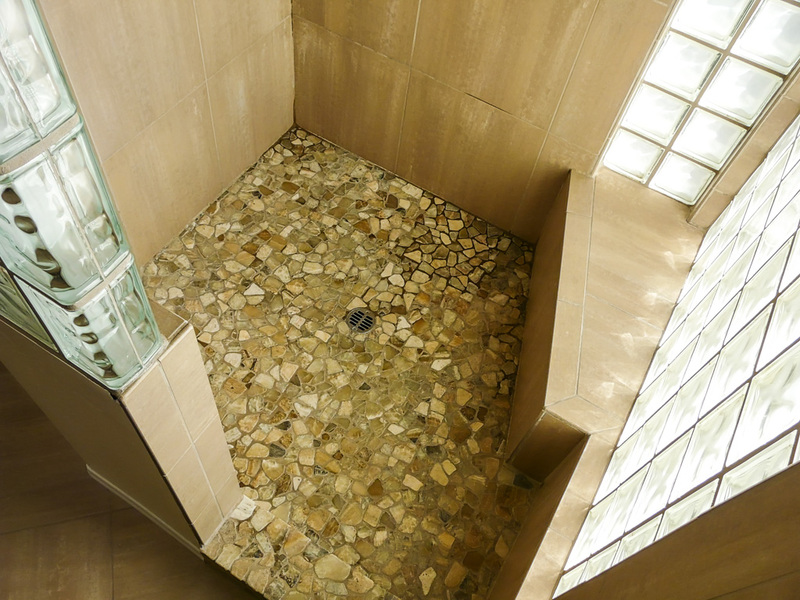 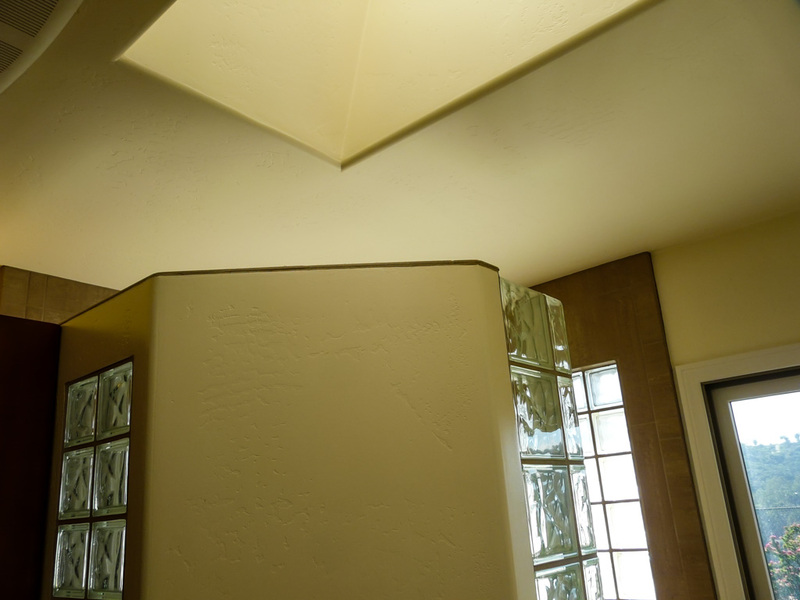 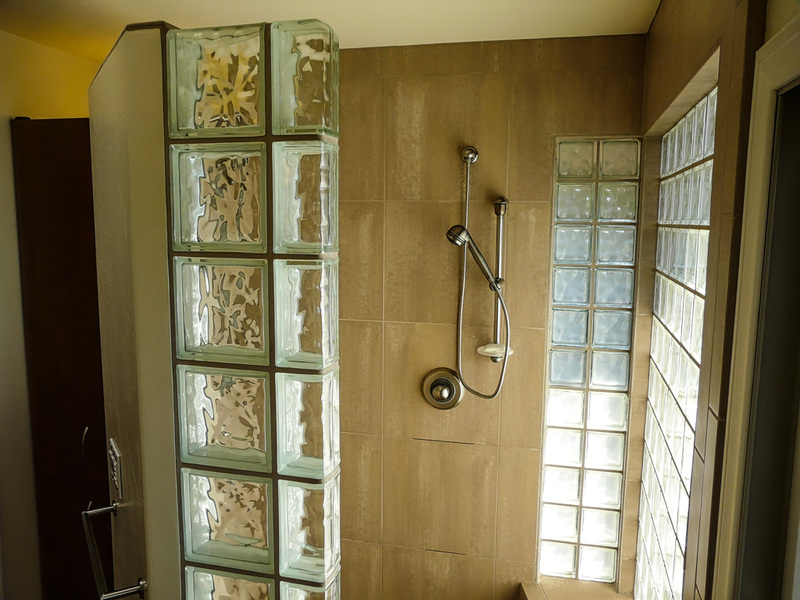 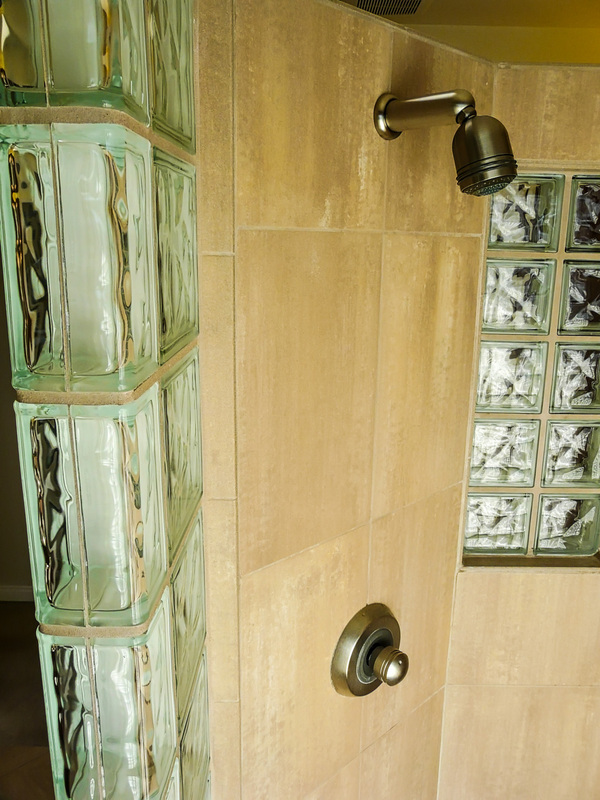 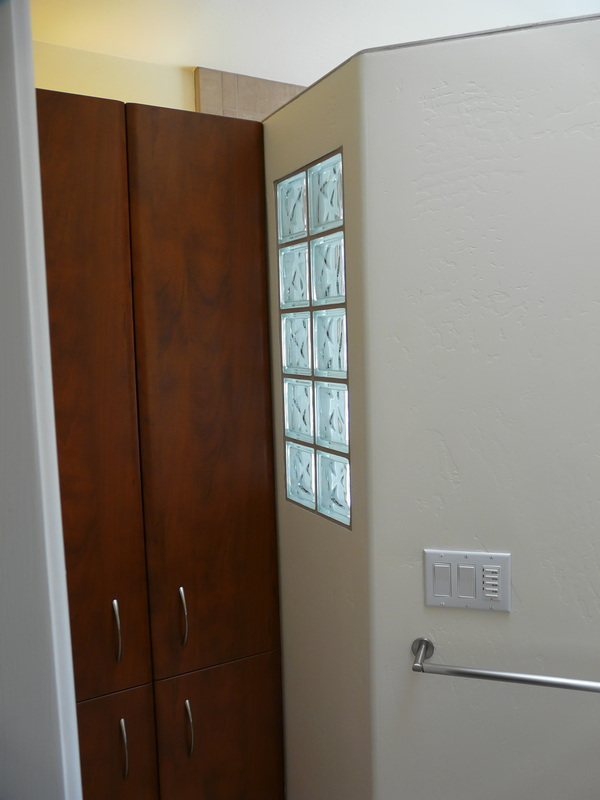 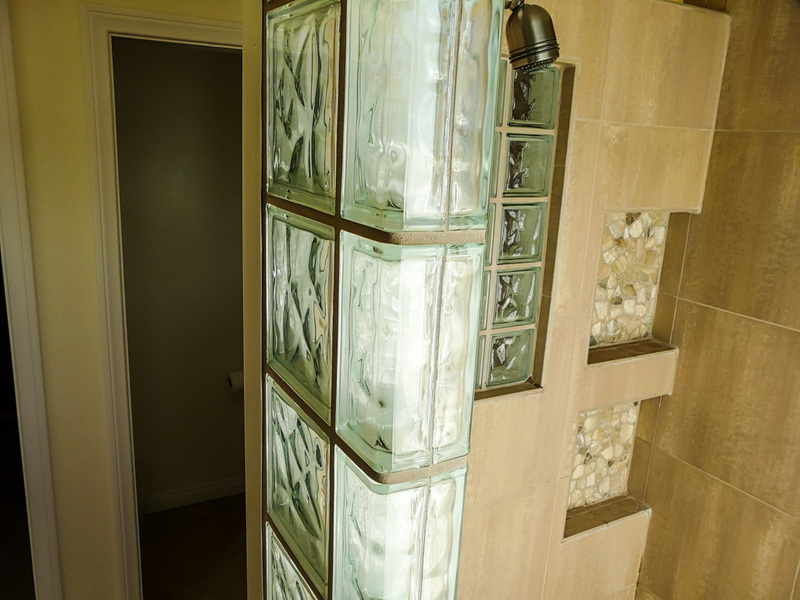 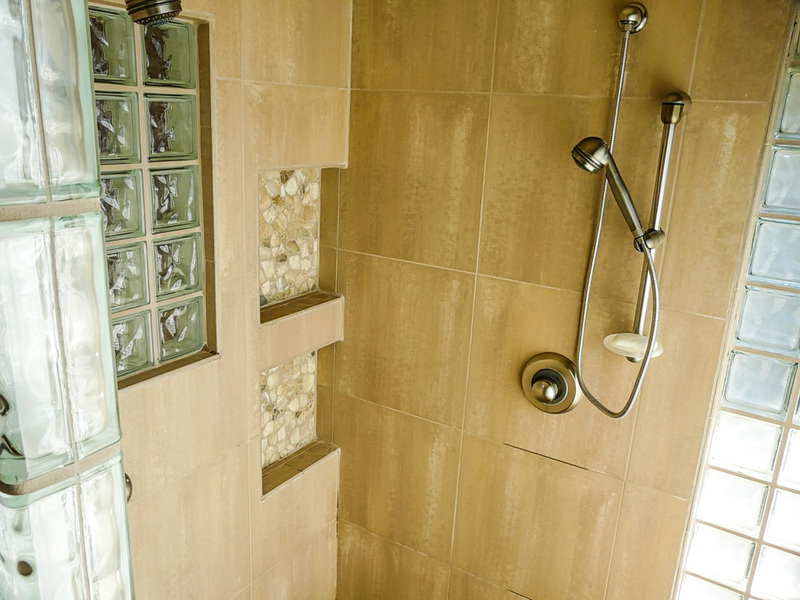 Similarly, we added glass block to the interior shower partition walls which do not go to the ceiling, stopping at 7 feet tall, for a similar artistic affect and to allow light to pass into the shower from those areas as well. 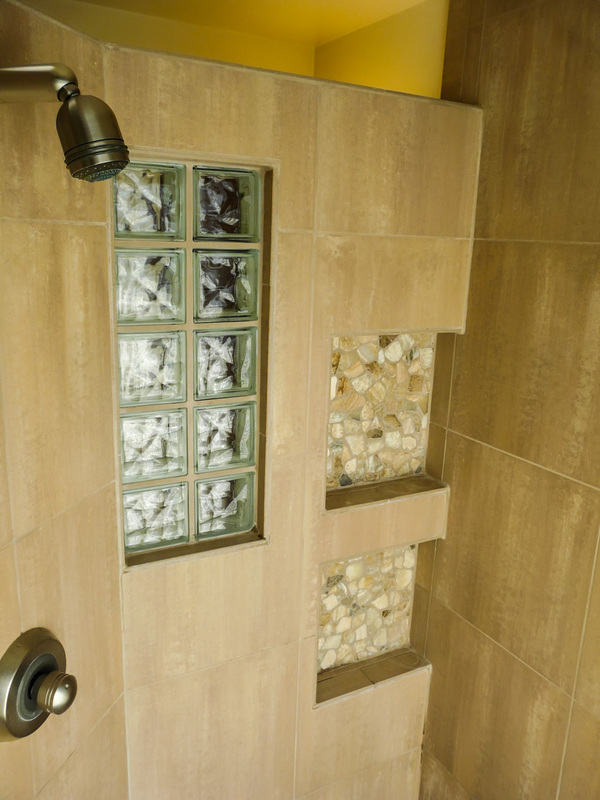 The client picked a very stylish combination of materials for the shower, porcelain tiles that mimic natural stone for the walls and real natural stone mosaic tiles for the shower floor and shampoo box backs that look great with the glass blocks. 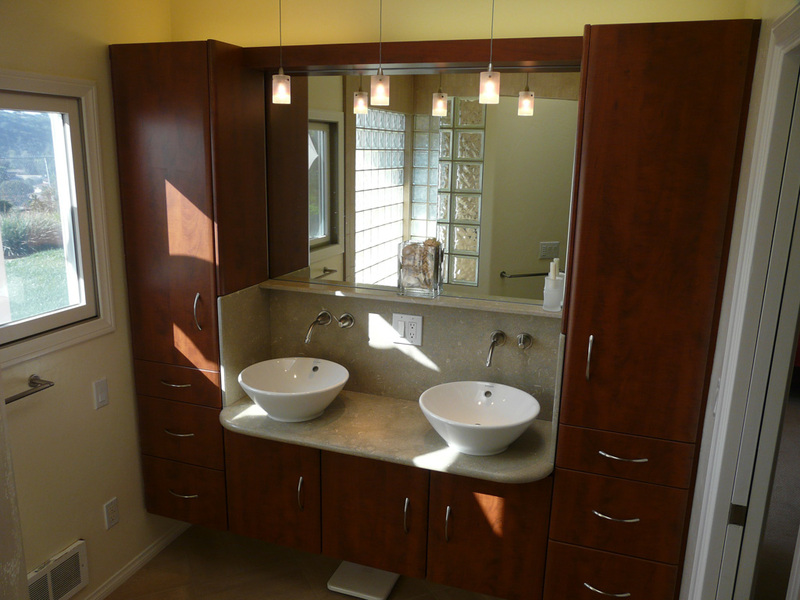 We used a lot of indirect lighting for this bath. 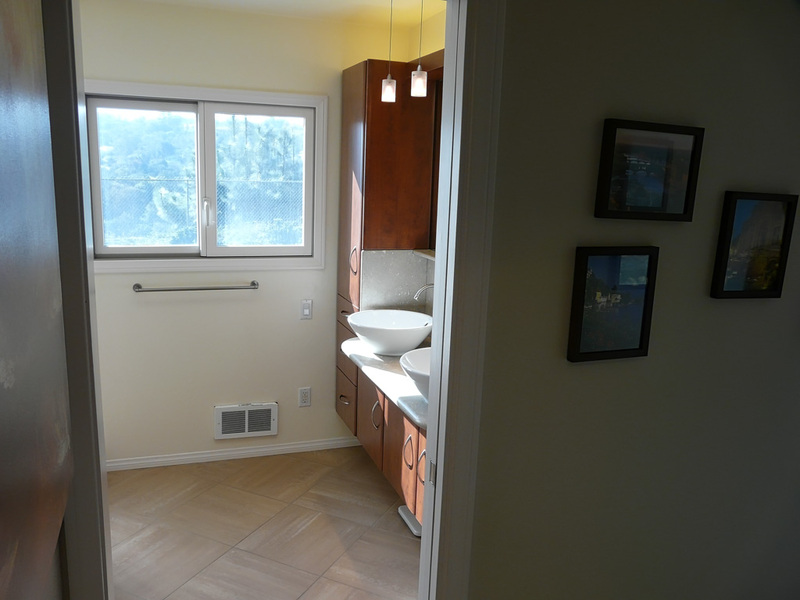 Fluorescent lights atop the sink cabinets and linen cabinet next to the shower provide ample soft ambient light for the whole room. 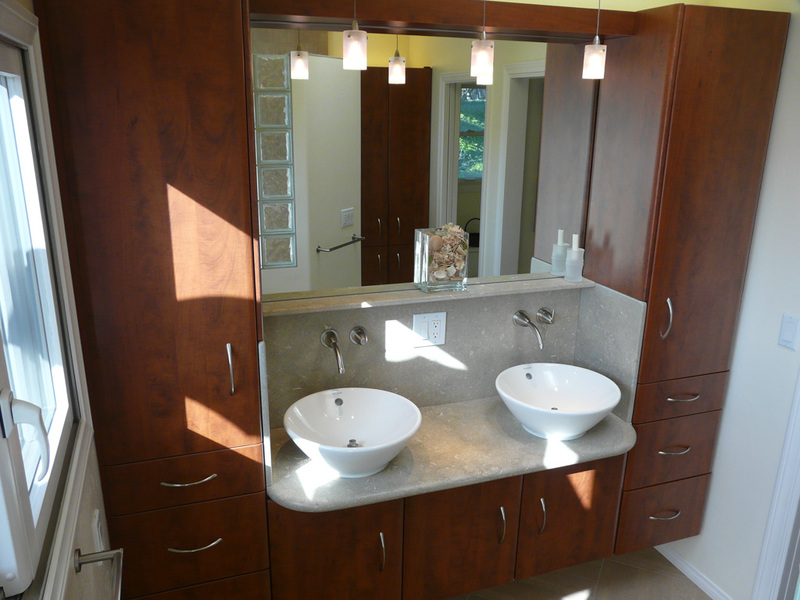 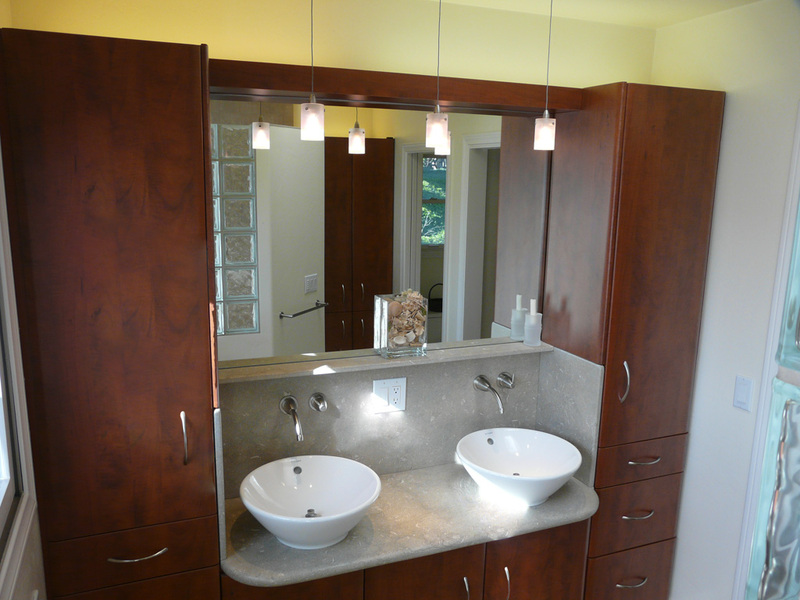 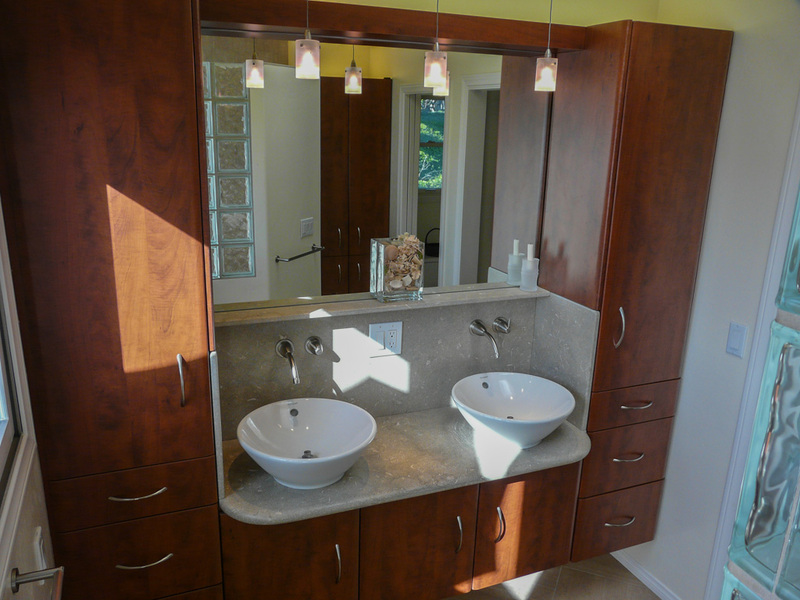 The pendants focus some light over the sinks. 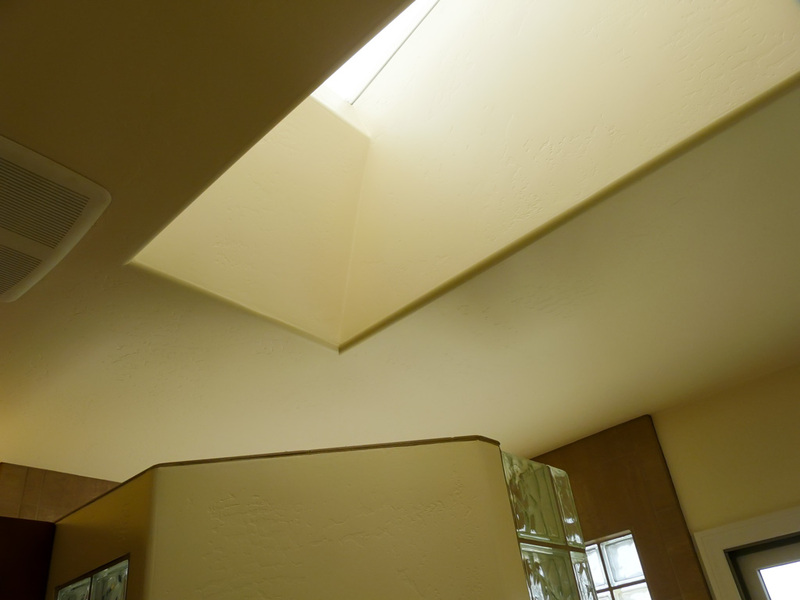 The skylight gives this bath supplemental natural lighting during the day, shower’s glass block windows allow the exterior lights to shine through for indirect lighting at night. 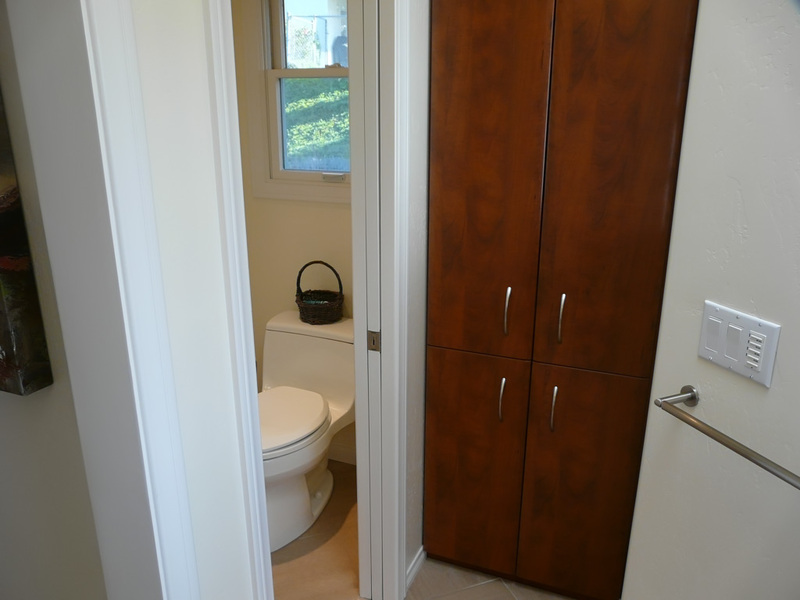 The cabinets are a very clean laminate with soft rolled edges in a Euro style I started using many decades ago that lends itself to an incredible amount of storage available. 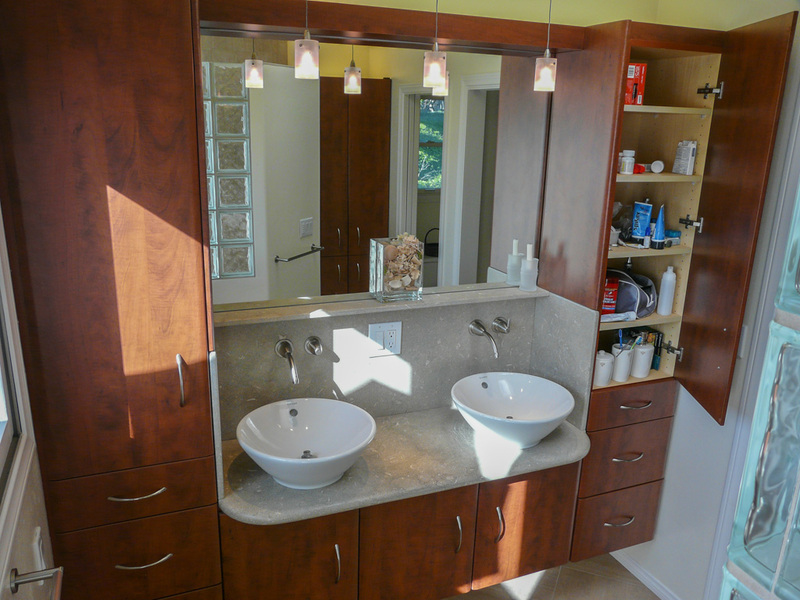 The added outlets inside the cabinets next to each sink make this area function incredibly well. 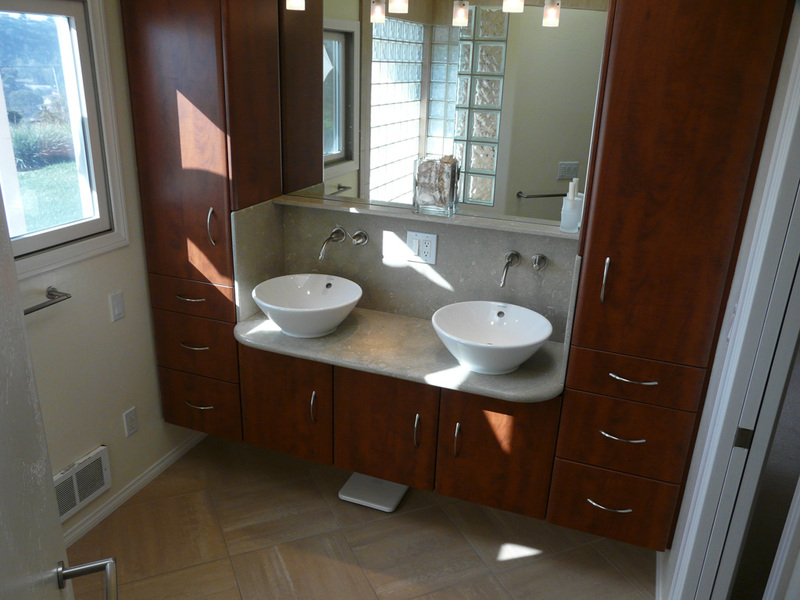 The clients choice of the tall vessel sinks and wall mount faucets compliment the look and functional ease of this bath. 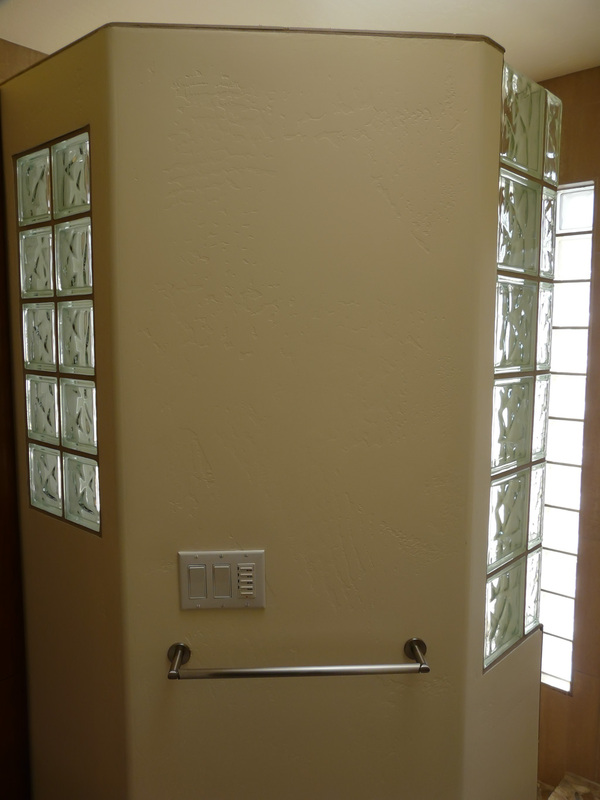 The only thing needed to upgrade this project today is to change out the fluorescent lights over the cabinets, the pendant bulbs, and exterior light bulbs to LED versions.